We run a naturally simple, yet very beautiful and clean guesthouse for those people seeking for a real experience in Auroville, instead of staying in the usual tourist accommodation. We have a peculiar community atmosphere and we are immersed in nature, which here is characterized by the tropical evergreen dry forest and the most colorful birds. 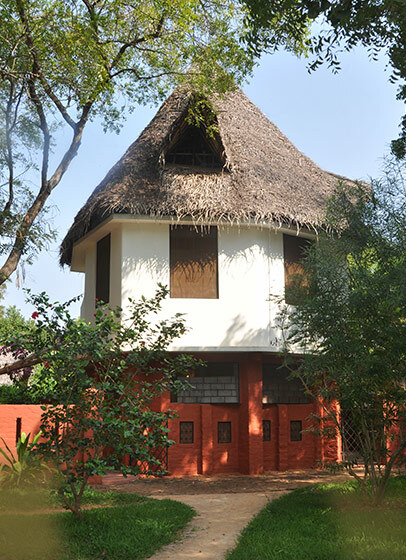 At the same time, we are located in the very center of Auroville, only a few hundred meters from the Matrimandir, the Visitor’s Center, the Town Hall and the Solar Kitchen. Our place is perfect for a diverse stay as you can relax in a hammock in the garden or be active and do any practice in our beautiful yoga hall or help in our organic vegetable garden. For those who are interested and stay long enough, we are also happy to share our experience here and some of the history and complexities of the “City of Dawn”. Time to time we even organise a 4-days intensive program – Experience Auroville – for people who wish to discover some very interesting projects and deepen their understanding of Auroville: an intentional community in the making, aspiring for unity in diversity, yet far from the dream in the current reality. Our guesthouse has a large variety of accommodation styles to meet the needs and wishes of each and every guest. Our DORMITORY accommodation facilities are mainly made of wood and bamboo and have a traditional coconut roof; they are more suitable for guests on a budget or looking for a rural Indian adventure. Our BASIC & STANDARD (shared bathroom) & COMFORT (attached bathroom) accommodation facilities are very diverse, but they all have in common a beautiful design; they are more suitable for guests who prefer a comfortable lodging or a tranquil experience.Take in consideration that once reservation is confirmed, we’ll only guarantee for the standard that you have chosen, but not a specific room that you might like, even though we can note your preference. Also, if you want to stay in a room, but you want to save some money, we can find someone (same gender) for you to share it. All types of accommodations are equipped with fan, electricity, and power back-up for lights only. Comfort rooms additionally have even fans connected to power back-up. Note that power-cuts in Tamil Nadu are a daily occurrence. All the showers (shared or private) are connected to a solar heater that provides hot water all-year round, even during monsoon and in the night thanks to the electric back-up. We have a well-equipped common kitchen that is available for guests use. Please bring your own flashlight, towel, toilet paper, soap, etc. We have lockers available for guests staying in shared accommodation, but bring your own lock. We are an alcohol and drug free campus, while smoking cigarettes is allowed only in a dedicated area. Included in your stay: free low speed WiFi internet, free yoga hall and mat use (out of class time), drinking water, some common kitchen items, taxes and Auroville guest contribution. We provide bed-sheets, blankets and bed mosquito nets for all types of accommodation. Not included in your stay: bicycle use (Rs. 50 per day, 40 % discount if you take it for at least 2 weeks), laundry (Rs. 200 per washing machine load), food, and any class happening in our multipurpose hall. We have a 2-nights minimum stay from the 1st of May until the 31st of June, the 14th of December, 3-nights minimum stay from the 1st of July till the 20th of November, and a 7-nights minimum stay from the 1st of December till the 31st of March. This is because we like to have the opportunity to get to know our guests a little better, and it’s also difficult to fully enjoy or understand Auroville in any less time. Our Office Hours are from 8.30am-4.30pm Monday to Saturday and we are closed on Sunday. Check-in time is from 2 pm onwards and check-out time is up to 11 am. If you need to arrive on Sunday or in the evening / night due to your flight schedule or any delay, please book a hotel for the night before arriving to Auroville as after office hours you won’t find anyone of the staff to welcome you. If you need to arrive early in the morning, please come only after 7 am and wait in the common area in front of the kitchen until the office opens up. Also, shops and restaurants in Auroville close down around 9 pm, so please come prepared with food/snacks if you’re arriving late.